Follow this link and enter your address at the top of the page to get turn-by-turn directions with google maps.. If you are driving, remember to obtain a parking permit. Broxton Public Parking is a $3 flat rate after 6PM, 1036 Broxton Avenue (off Weyburn) - not a UCLA facility but it is relatively close to the Semel Institute. There are other parking facilities in Westwood. We have taken the liberty of compiling a list for your convenience. Rates and information are subject to change as these are private facilities. Metro - Metro Lines 2, 302, 305 and 761 serve campus, or transfer from other Metro Bus lines. Santa Monica Blue Bus - Lines 1, 2, 3, 8 and 12 bring you to campus, or transfer from other lines. Culver City Bus - Line 6 brings you directly to campus, or transfer from Lines 1-5. Take the San Diego Freeway (I-405) towards Westwood; exit at Wilshire Boulevard, heading East (to Westwood). Turn left (North) onto Westwood Boulevard. Go north on Westwood Blvd; slow down when you cross Le Conte Avenue at the 4th traffic light and enter the UCLA Campus area. 300 UCLA Medical Plaza: Turn LEFT at next intersection and proceed to underground parking. NPI/Semel Building: Proceed to parking information kiosk NORTH of Charles E. Young Drive. Take the Santa Monica Freeway (I-10) toward the intersection with the 405 (San Diego Fwy). Take the 405 North; exit at Wilshire Boulevard, heading East (to Westwood). 300 UCLA Medical Plaza: Turn LEFT at next intersection and proceed to underground parking kiosk. NOTE: UCLA parking information kiosk hours vary, please check online for times. Parking details for workshops or daylongs are given to pre-registrants at least 48-hours prior to event. Please call (310) 206-7503 if you have any questions. Park in the underground Medical Plaza parking structure. When entering 100, 200, 300 Medical Plaza parking, stay on the 200/300 lane. Park and take the 300 Medical Plaza elevators. Campus permits are $12 and $7 for Disabled Placard. When you enter the parking structure, take a ticket and you can pay when you exit. The Marisa Leif Conference Room is room 3200, it is located in the 300 Medical Plaza building which is next to the 200 Medical Plaza building and directly across the Jules Stein building and south of The Ronald Reagan Hospital and Charles E. Young Dr. Marisa Leif Conference Room is on Level 3. Enter from Westwood. At 300 MP building, go through automatic double doors. Take the elevators in the lobby area to level 3. Make a right out of the elevator and Marisa Leif Conference Room (#3200) will be straight ahead. Room 3105 is located in the 300 Medical Plaza building which is next to the 200 Medical Plaza building and directly across the Jules Stein building and south of The Ronald Reagan Hospital and Charles E. Young Dr. Room 3105 is on Level 3. Enter from Westwood. At 300 MP building, go through automatic double doors. Take the elevators in the lobby area to level 3. Make a left out of the elevator and make then make a right when you are in the waiting room. Room 3105 will be the first door on your left. You should go to the parking information kiosk (kiosk #6) north of Charles E. Young Drive So., in Westwood Plaza to purchase a pass. This is the main campus kiosk and is open from 6AM to 10PM daily. The parking attendant will direct you to the appropriate parking area that is close by. It is also helpful if you ask the attendant to draw on a map your parking area in relation to the NPI/Semel Institute. See map for building entrances. Hours of operation for other UCLA parking information kiosks vary, so please be sure to check online. Click here to get a map for the area. C SPACE is located in room #67-415 on Level 6 of Semel Institute/NPI. Semel is 740 Westwood Plaza. Directly across Westwood from 100 UCLA Medical Plaza, north of Jules Stein Drive and south of Charles Young Dr. C-Level is street level. Enter from Westwood Blvd. Go through automatic double doors. Make a left at the end of the corridor, take the 'H' elevators to the 6th floor. Make a right (west) out of the elevator area, go past a corridor, C-Space /Room 67-415 is the first door on your right. 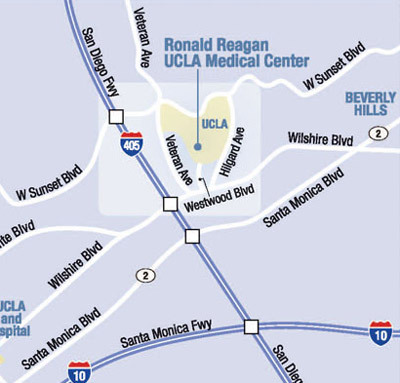 Room C8-177 is located in Semel which directly across Westwood from 100 UCLA Medical Plaza, north of Jules Stein Drive and south of Charles Young Dr. The room is on the street level. Enter from Westwood. Go through automatic double doors. Walk straight down corridor. Turn left. Room C8-177 is on the left side, after the men's room and the Psychiatry Resident Library. NPI Auditorium, C8-183 /Semel Institute Auditorium is located in the Semel Institute, which is directly across Westwood from 100 UCLA Medical Plaza, north of Jules Stein Drive and south of Charles Young Dr. Enter from Westwood Plaza. Go through automatic double doors. Walk straight down the corridor. Turn left and the NPI Auditorium will be on your left, above the staircase. Alternatively, you can enter from the entrance at 720 Westwood Plaza.